As I wrote in my review of Sherman Alexie’s book The Lone-Ranger And Tonto Fistfight In Heaven, Smoke Signals is based on various stories and characters found in that short story collection. In cooperation with Sherman Alexie, who wrote the screenplay, director Chris Eyre straightened out some of the disjointed parts and managed to make them into a cohesive whole. It has to be said however, thankfully in my opinion, that the short story character of the book is continued here via a large amount of flashbacks that are intervowen into the story quite masterfully, so in that respect alone the film very much succeeds. But that’s by far not the only level on which it does so. First and foremost, the acting is uniformly excellent. I especially have to mention Evan Adams as Thomas Builds-the-Fire here. How much I admired that character should be made clear if you read my review of the book. But after watching the film (which I had seen before I read the book) again, I have to say that this admiration is closely linked to Adams’ unforgettable performance in the film (talk about deserving an Oscar in a better world). His performance is equal parts hilarious, tragic, and most of all, singular and magnificent. The acting on part of both Thomas’ and especially Victor’s 12-year old selves isn’t half bad as well. You can tell that there is a whole lot going on behind young Victor’s stoic and mostly silent face, it’s an absolute pleasure to watch. Also exceptionally good is Gary Farmer’s performance as Victor’s dad Arnold Joseph, but that shouldn’t come as a surprise to anybody that has ever seen him in a performance before, even if it’s just a brief one as in Jim Jarmusch’s Ghost Dog : The Way Of The Samurai. He’s got an incredible presence in front of a camera (and I assume in life), he’s hard to forget. Here he shines as Victor’s crazy, drunk and abusive dad that flees the family and reservation life to Phoenix, Arizona where he can’t forget what he’s done at all. It’s also here he dies a lonely death in a trailer somewhere out in the desert. Pretty much his only company in this barren desert seems to have been beautiful Suzy Song (played equally wonderfully by Irene Bedard) who he forms some kind of relationship of rather undetermined nature with. Whether they were lovers or having some kind of father-daughter relationship is left open by what Suzy’s tells Victor and Thomas during the longer scene in which Victor (played by Adam Beach) and Thomas stay with her for one night to pick up Arnold’s ashes. To the credit of the filmmakers, there’s not a romantic scene developing between handsome, athletic alpha-male Victor and Suzy. There’s a shine in here eyes in the beginning, sure, but as the scene develops it becomes clear that she’s rather taken aback by his somewhat harsh behavior and the problems he doesn’t seem to be able to adequately express, let alone handle. She’s also rather intrigued by the stories Thomas’ incessantly tells – probably the first person in a very long time to respond positively to them. Of course Victor and Thomas don’t make it back to the Coeur D’Alene reservation without any problems, as they get involved in a car wreck, but luckily for them things end relatively well and they don’t get arrested by the police for their role in the crash. They arrive back on the reservation with, one can only hope, a new kind of understanding between them and a softened attitude on Victor’s part towards Thomas. 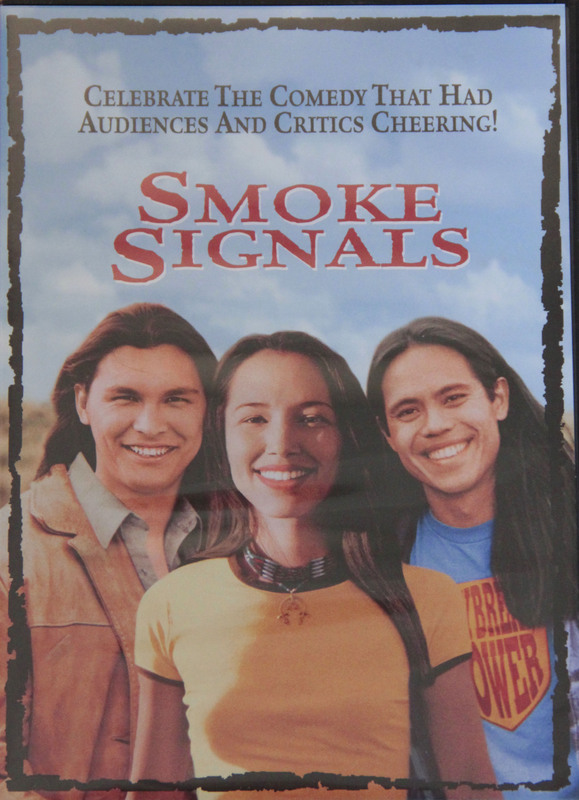 As I am a rather visually oriented person, adding a lot for me to making me love Smoke Signals, are the wonderful landscapes seen in numerous long shots of the Coeur D’Alene Indian Reservation in Idaho on which the film was shot for the most part (some scenes were shot in Washington). Not surprising, but very welcome nevertheless, are the flashes of humor, of course mostly on Thomas’ part, such as in conversations like this one: Victor: ‘… you gotta look like a warrior, you gotta look like you just came back killing a buffalo’. Thomas: ‘But our tribe never hunted buffalo, we were fisherman’. Taking a step back compared with The Lone-Ranger And Tonto is the focus on the more serious and difficult realities today’s Native Americans face, the signs are everywhere you look of course, but this film is primarily concerned with the themes of forgiveness and coming to terms with what happened in the past. A beautiful, humane and compassionate film. This entry was posted in Books, Films and tagged Adam Beach, Chris Eyre, Coeur D'Alene Indian Reservation, Film, Gary Farmer, Idaho, Native American Interest, Sherman Alexie. Bookmark the permalink.